JAKARTA -- The Philippines recorded two bronze medals as the men's and women's poomsae teams both reached the semifinals of the taekwondo team poomsae competition in the 18th Asian Games at the Jakarta Convention Centre on Sunday. The men's team composed of Rodolfo Reyes, Jr., Jeordan Dominguez and Dustin Jacob Mella beat Saudi Arabia 8.18-7.64 in the round of 16 before topping Iran 8.33-8.10 in the quarterfinals to advance to the semifinals versus China. But the trio lost to the Chinese, 8.180-7.830. Meanwhile, the women's team, composed of Jana Dominique Oliva, Rina Babanto, and Juvenile Faye Crisostomo, ousted Hong Kong 8.00-7.49 in the round of 16, then squeaked past hosts Indonesia 8.07-8.04 to also book a semifinal slot. But like their men's counterparts, the women's team lost in the semifinals to Korea, 8.020-7.110. Oliva and Babanto told ESPN5 they still competed despite suffering injuries, saying they continued on because participating in the Asiad is a once in a lifetime opportunity they couldn't miss and that everything was worth it. 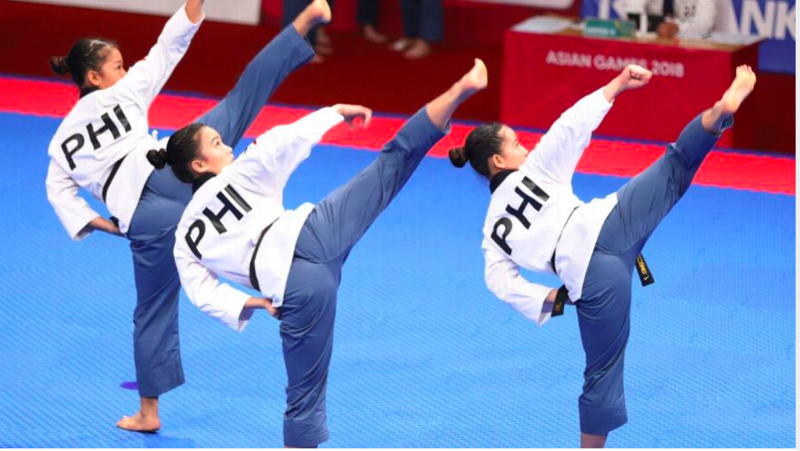 The Philippine bets in individual poomsae were not as lucky as Reyes and Jocelyn Ninobla both failed to advance. Reyes was eliminated by Thailand's Pongporn Suvittayarak, 8.08-8.32, in the quarterfinals. He had advanced to the last eight by knocking off Ruslan Manaspayev 8.08-7.08 in the round of 16. Ninobla lost in the round of 16 to Vietnam's Tuyet Van Chau, 7.89-8.11. Information from ESPN5's Apple David was used in this report.